The New Jersey preschooler who died of the respiratory illness enterovirus 68 went to sleep and never woke up, health officials say. 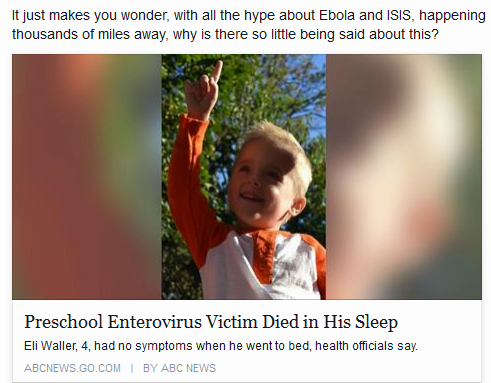 The death of 4-year-old Eli Waller is the first to be blamed on the virus that has swept the country, but health officials say he went to bed with none of its symptoms, which include cold-like symptoms but in some cases can involve wheezing and difficulty breathing. Eli, of Hamilton, New Jersey, was the youngest of three triplets, born “smaller and lighter than his sisters,” but he was never one to let that stand in his way, his father Andy Waller said in a letter released Sunday evening. His siblings are “perfectly healthy,” Plunkett said, but one of Eli’s classmates was being tested for possible infection this morning. 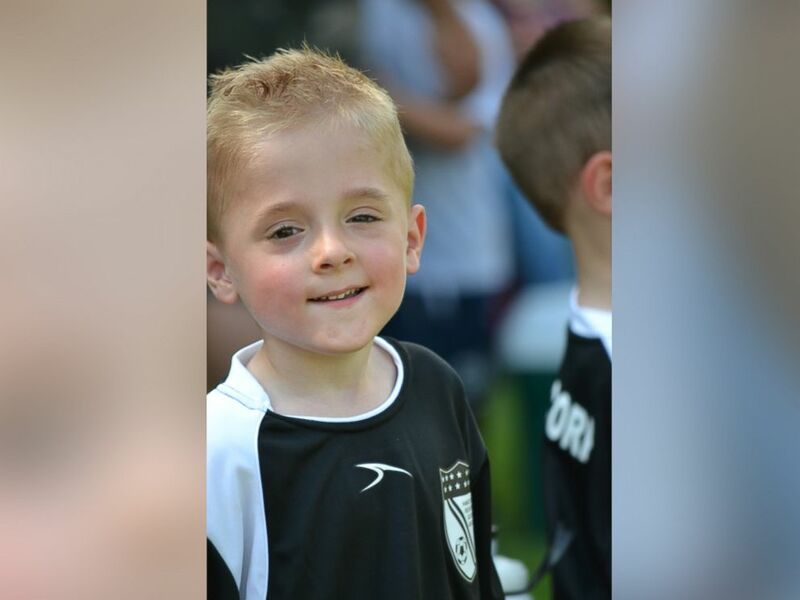 “Eli was not the type to give up, and even though things never really came easily to him, he would just plug away, day after day, practicing sounds, or movements, or skills, until he would eventually get them,” his father said. “He did this entirely in an effort to make his Mom and Dad proud, and we can unequivocally say that we were, and will continue to be, so very proud of our little Eli,” he said. Andy Waller said the family was establishing The First Day of School Foundation, to provide support for students involved in Special Education. “Like so many kids his age, Eli was both nervous and excited about starting school, and it is our sincere hope that this Foundation can work to help kids in a way that will make Eli proud of us all, in the same way that we were all so proud of him,” he said. Sharing a very informative comment on this article. “Many here are confusing the issues. We are researching the explosion of EV-d68 and what can only be classified as an uncharacteristic, potentially deadly strain. We are focusing on the distribution patterns first and foremost. Ancient citations about EV-d68 are not applicable in this case at this point. The message I hope to convey is that Americans should be diligent. They should know what’s happening in their communities and schools and take basic protective measures to minimize exposure. But I am also now compelled to discuss, somewhat, the applicable science, mainly because of the misleading information being spread on the internet by others, some of whom seem to have personal or even professional agendas. ago in the early days of HIV and have enormous respect for his opinion. EV-d68 refers specifically to a virus, known as Enterovirus species D, serotype 68; more commonly referred to as EV68. It should not be confused with EVD (Ebola). opposing political views and opinions of those who are clearly trying to distance this crisis from US Policy, the way the border crisis has been managed, or potential adverse effect on immigration reform. I could care less about any of these issues within the context of researching and understanding this epidemic. EV68 is not a new disease. The key difference now is the widespread explosion in the general population. Increased occurrence leads to greater probability of mutation. demonstrate higher rates of infections certain years and lower rates in other years. But never in the classified history of EV68 has any place in the world experienced the widespread, lightening fast explosion we are seeing now. Someone suggested in this forum that reviewing viral patterns would help the lesser informed understand that EV68 is no big deal. But the frequency of EV68 in 2014 cannot be determined until the final numbers are in, and we are in mid crisis. What we DO know is that EV68 has never spread so rapidly or been so widespread in the United States. Therefore historic charts and tables offer little scientific value towards understanding this very uncharacteristic strain. The viral pattern “peak” for 2014 will be astronomically higher than in any previous year. EV-d68 crisis occurred in Philippines in 2008-2009. The virus underwent several mutations and spread rapidly but primarily in the Eastern Visayas region. It did not spread to the general population as a whole. Breathing difficulties were observed here also, but the outbreak, though large, was clustered and the outbreak was not considered problematic relative to other diseases, i.e. pneumonia. But that is not the case with the EV-d68 strain endemic in United States today. Clear data show the relationship between children with other respiratory problems and the severity of symptoms. Much work has to be done to study the antigenicity and receptor binding properties of the current strain of EV-d68 in comparison to the prototype strain of EV-d68. This is the main reason I have called attempts to explain and define, and even minimize the current crisis “premature” and “irresponsible”. We must study the pathogenesis to determine why so many children are the primary groups infected. The correlation of the age groups of the immigrant children on the border and the placement of those children in similar population age groups, where EV-d68 is now exploding cannot be ignored, even though it has been observed in this age group in the past. Particularly when emerging distribution patterns verify the placement of many of these children across the United States with outbreak epicenters. More alarming, we now understand that EV-d68 behaves like a flu virus insofar as it affects a cell by binding to the same target as a flu virus – α2-6 sialic acids. Evidence now suggests that EV-d68 may actually be capable of evading the immune system, breaking down certain chemical signals before the immune system can be alerted to the “attack.” Utilizing a protein called 3C protease, EV-d68 can break down immune signal in cells and prevent some of the normal immune system response. This enables the virus to continue to infect a person who may be unaware they are sick. But then they become seriously ill very quickly. seriously ill and some of them will succumb to their illnesses. My opinion is that would be a preventable tragedy for the majority of them. This particular outbreak appears to have had a lot of help distributing itself across the country. To the “historic data” flag wavers, I remind you that an EV-d68 outbreak of this magnitude has never occurred before, and; for more than half a century, EV-d68 has been infecting population clusters. So why is it so widespread now? Why is it causing numerous more serious symptoms, more severe infections? Like the common cold or flu, infection is preventable by washing your hands with soap and water and also regularly disinfecting surfaces. If you do get sick, there is only a small chance it will get worse; most children and adults will have few symptoms. Finally, if there is a problem, such as respiratory distress, our hospitals are prepared to provide the appropriate care to help facilitate a full recovery.